It’s a hand-painted sock-knitter’s world out there, and I’m just living in it. Or so it seems, a lot of the time. And while I have my own little stash of hand-painted and hand-dyed sock yarns, it makes it that much more of a relief to be reminded that a person can actually knit quite a decent pair of socks for less than $20. This new finished pair speaks the truth – a lovely comfy and sturdy pair from Fibra natura Yummy in what I believe is the Raspberry Mocha colourway (in a basic 3×1 ribbing which has become my fall-back sock pattern lately). This is a pot-dyed yarn with the swooshy-mottled colour consistency reminiscent of hand-painted yarns, but with a tight twist and sturdy texture more like Patons Kroy Socks. For me, this is a good thing. I’m telling you, once you feel the twist on this stuff…I’ll just say I’ll be surprised if this doesn’t wear extremely well. I have another skein of this in the Sangria (both courtesy of the Purple Purl…someone should really go back there and buy all the Grapesicle purple skeins before I succumb even more), and I’m happy to knit another. As long as they keep on expanding the colour line I don’t see why this yarn shouldn’t be a popular seller. Lisa is using hers in a pair of gloves and is already planning a second pair, which tells me the attraction can’t just be a figment of my imagination. And now…I need a new pair of socks to cast on. Decisions, decisions! Cute socks! I’ll have to keep my eye out for the yarn. I’m always up for less expensive, good quality sock yarn. I’m sure you’ll have no problem finding a pattern. It might be the yarn choices that sound like they could cause some indecision! I’m in the same boat as you – what socks to knit next. 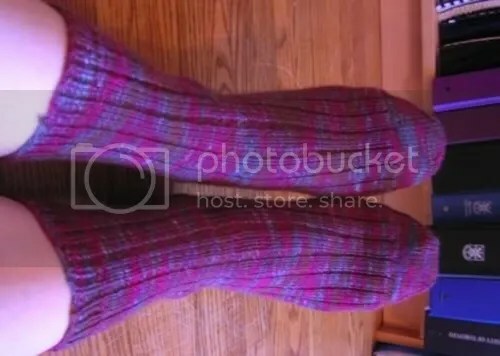 I’m just about finished a pair of knee high Noro socks inspired by yours. oh, those socks look great! i’m knitting a pair of jaywalkers right now and i JUST realized i may not have enough yarn for both socks (as i am 3/4 finished the first sock.) it is quite sad.